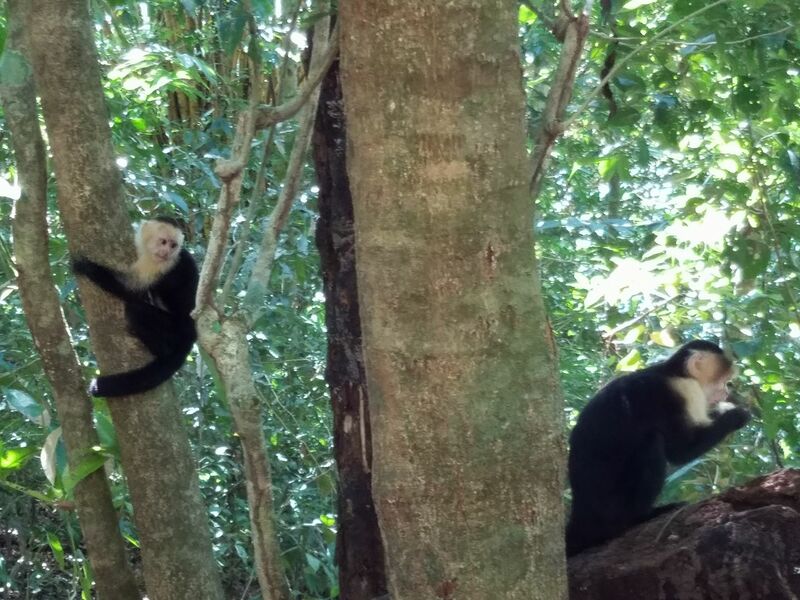 Monkeys and Ziplines and Yoga, Oh Pura Vida! After returning from a getaway to the Caribbean, I was hit with a wave of post-vacation blues. Fortunately, I knew this would happen and lined up a trip to Costa Rica for New Year’s. But because the typical 9-to-5 doesn’t allow much freedom in terms of time off, and because money can also be an issue when it comes to travel, none of my friends were available to break free from their shackles to come along on an adventure with me. I was in need of some serious refreshing and wanted to meet like-minded people, so within a few pokes of my keyboard and setting aside money months in advance (it can be much easier than you think), I found Under 30 Experiences, a travel community for young adults. The rest is history. As expected, the majority of friends and family I talked to about this thought it was “weird” or “dangerous” because I didn’t know these people and had to meet them in a foreign country. “How do you know these people really exist?” was a question asked more than once. Of course, I did my research, was in touch with the team beforehand, and trust my judgment. Spoiler alert: The people of Under 30 Experiences exist and are not perverted psychos trying to lure in foolish young adults. There’s a whole world out there worth exploring (while also using your brain). That’s the whole idea of this incredible community! Onto the good stuff. I landed in San José, Costa Rica on a Friday afternoon and met one of the two group leaders, Delphine, right outside of the airport. 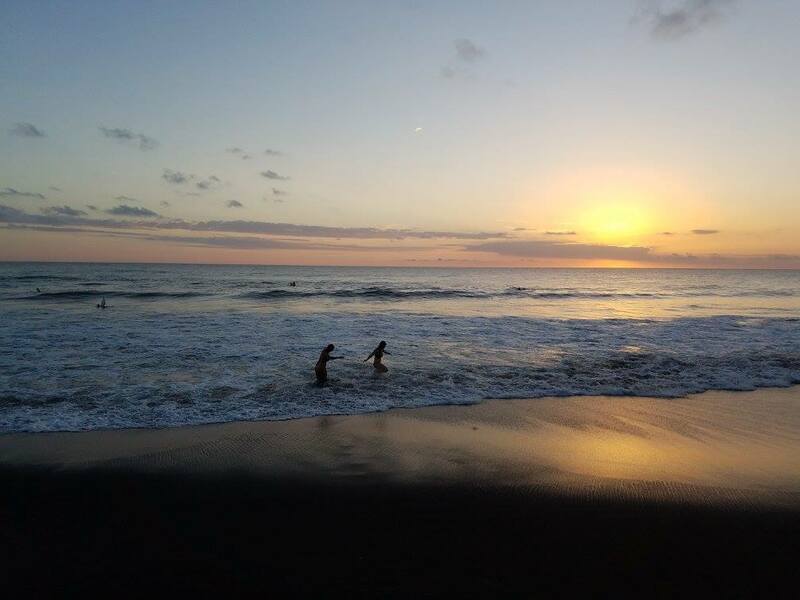 After everyone successfully made it out of the baggage claim, the 14 of us boarded a bus and headed to watch the sunset over Playa Hermosa. We frolicked in the water and got to know each other over dinner and drinks with a beautiful view of the Pacific. A breathtaking welcome to Costa Rica. After we soaked up the sunset and were feeling energized from fresh food (mainly tuna, mahi-mahi, and rice and beans), we hit the road for an hour drive to our home for the next five days: Hotel La Colina, in Provincia de Puntarenas, Quepos. We were each paired up with one roommate, and if you planned the trip with a friend, you roomed with that person. It didn’t matter who I roomed with, because every one of the adventurous souls I traveled with was filled with personality and spirit. But I must say, I hit the jack pot with my down-to-Earth, super-knowledgeable-nurse of a roomie, Alexa. Bonus points to us for both having the shirt that says, “My head says gym but my heart says tacos.” Yeah, mujer! 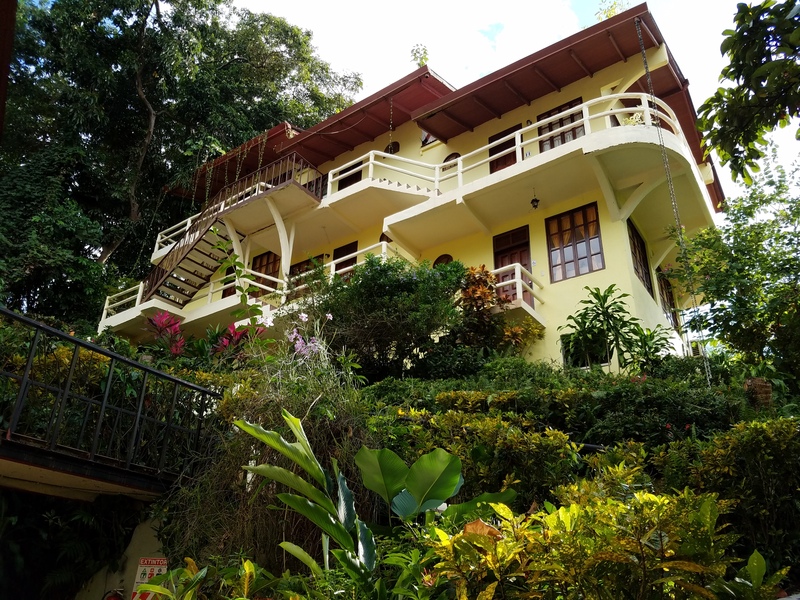 During our first full day, we enjoyed a nutritious breakfast of eggs, rice and beans, and fruit at the hotel and then took the local bus to Manuel Antonio National Park, which was about a 10-minute drive. It was a pleasant walk thriving with capuchin monkeys and desktop backgrounds. Don’t be hypnotized by the cuteness! Alexa and I got separated from the group because we were so obsessed with these little guys. Fortunately we paid attention to where the group would be at certain points and found our way to the beach to meet everyone. A typical desktop background in its natural habitat. 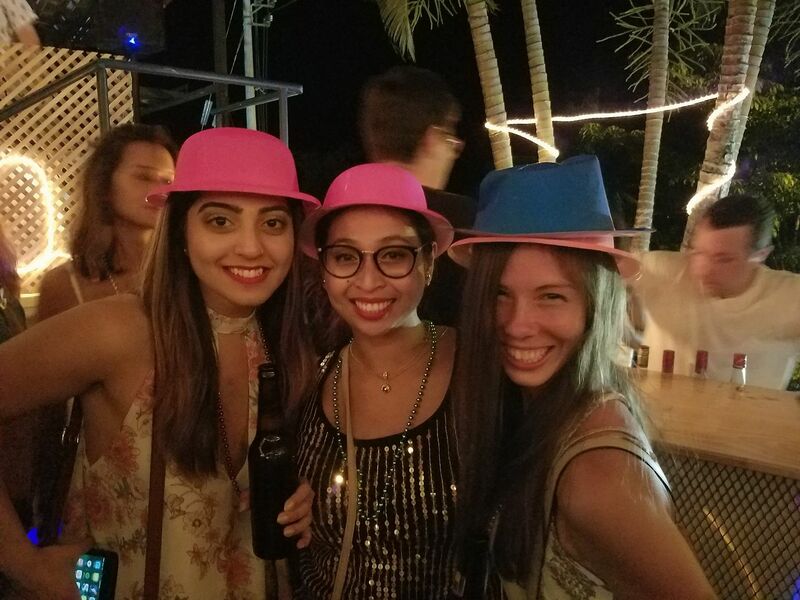 Since it was the end of the year and all, one of our biggest events was New Year’s in Costa Rica. While it wasn’t as bright and bustling as I thought it would be at Selina, the club we hung at, it was an exciting time to be there. One of my group members, Ishita, and I played Imperial beer pong with an Australian couple and lost by one cup. It was okay because their accents were cool. Then we danced around the pool (yes, some people fell in). Ishita, Alexa, and I having a grand 2017. On the first day of 2017, we headed to the rainforest and split up for either zip-lining or an ATV tour. Four group members went for the ATV tour, and the rest of us took to the skies for a zip across the green in the pouring rain. It was a great adrenaline rush in such a calm, scenic area, and the last course was a “monkey jump,” which consisted of jumping down a waterfall (while still hooked up to a cable and in your harness). We also saw a sloth. Team Zipline ready for action. Pumped with stories, adrenaline, and a growing appetite, we settled down to feast at El Sol in Quepos. We sipped on Imperials and smoothies and enjoyed mainly dishes of fresh fish and rice and beans there. The food was always the perfect portion and made me feel energized and ready to go. 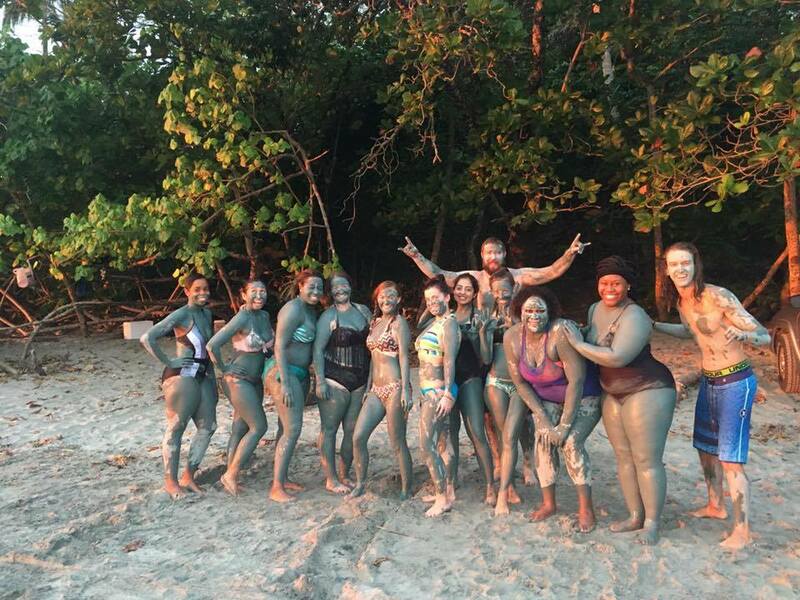 Afterwards, we explored Playa Espadilla Beach and painted ourselves in some sort of exfoliating Costa Rican blue mud that our group leader, Matt, brought us, and acted like wild Avatar people, screaming and running into the water and causing a scene. Fun times for sure. At night, we took a salsa dancing lesson and put our newly-found dance skills to use at Bahia Azul, a sad looking bar by day and a hot-spot of a joint at night. On our last day, the chicks and I took to yoga on the beach in the morning, and then the whole group enjoyed lunch at the delicious Cafe Milagro (delicioso quesadillas and coffee alert!). 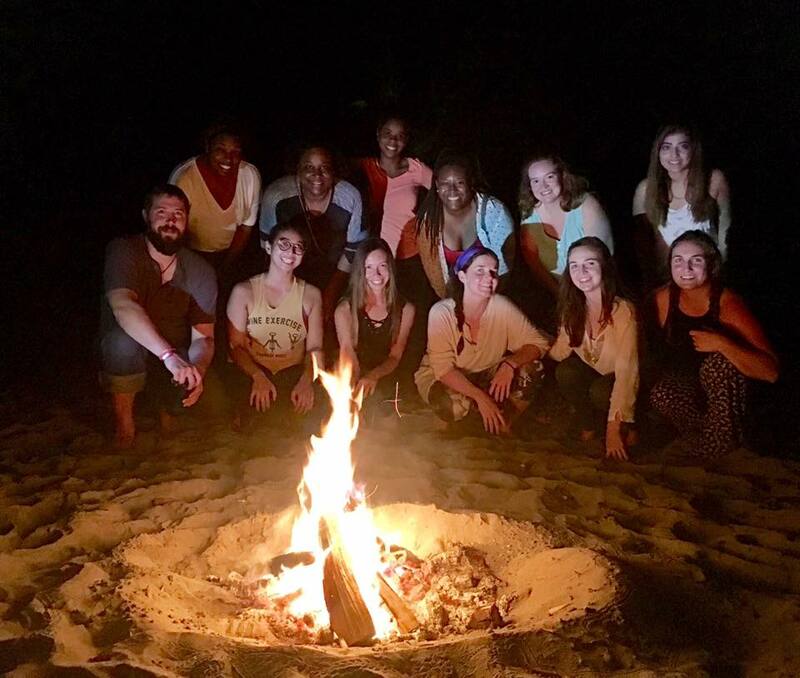 To close off our trip, Matt lit a fire for us on the beach and we sat around playing Two Truths and a Lie and Would You Rather? “The tribe has spoken.” We didn’t want to go! The bus ride back to San José on our last morning was bittersweet. I felt blessed to have met such a down-to-Earth group of strangers from different backgrounds who all had one thing in common: to get out of the norm and explore, because life’s too short to stay in one place in the world. In a short amount of time, we connected and became friends, and I truly wish to stay in touch with all of them as our journeys in this existence continue. To me, it felt like I knew these people longer than I have — there was a special connection there, because I think we can all agree we’re each other’s kind of people. We’re all connected on social media, but perhaps there are more in-person adventures up the trail. If you’re a young adult (age 21-35) who’s interested in exploring the world with like-minded individuals, look into Under 30 Experiences. The adventures are worth it. This is awesome. 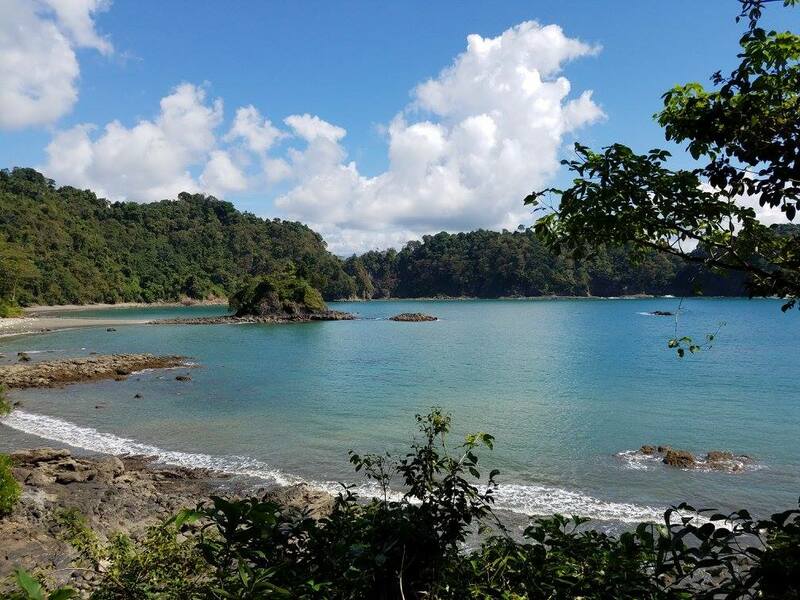 And I love calling Manuel Antonio home. Glad you got to visit this paradise. Gracias por leer! Costa Rica is a paraíso of its own. Enjoy those sunsets over the oceano!